Roger Samuels, 43, is a gospel singer and pastor from London. He grew up singing in church from the age of eight and performs at events such as weddings. He’s been married to his wife for 25 years and they have eight children and one grandson. He says his biggest dream is “singing in front of thousands of people”. He said two of his kids made him apply to go on The Voice. For his blind audition he sang Footprints In The Sand by Leona Lewis. He is team, Tom Jones. 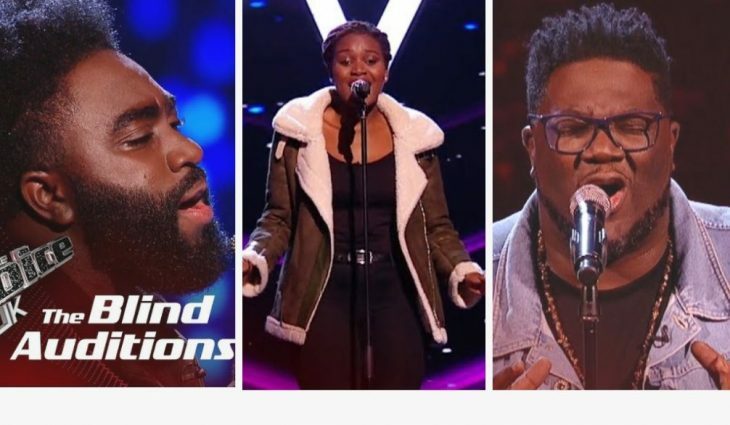 Equip To Overcome is another Christian Group that got the Voice Judge’s Sir Tom Jones, Jennifer Hudson and Will-I-am excited as they turned their chairs to the trio who hail from Kent. The 20 years old Gabrielle, Yolanda and Shalom said they met at the University of Kent, whilst studying the same course and decided to start a gospel group together. They are team, Tom Jones. Last but not least is the awesome Emmanuel Smith. The 29-year-old was born in Africa but now lives in London after moving to the UK with his mum as a child. If you are familiar with the London Gospel scene, then his name should be ringing in your ears. Emmanuel performed a cover of Hallelujah by Leonard Cohen and it got all four coaches to hit their buzzers. Have you spotted anymore U.K gospel artist we may have missed? Give us a shout for a feature.